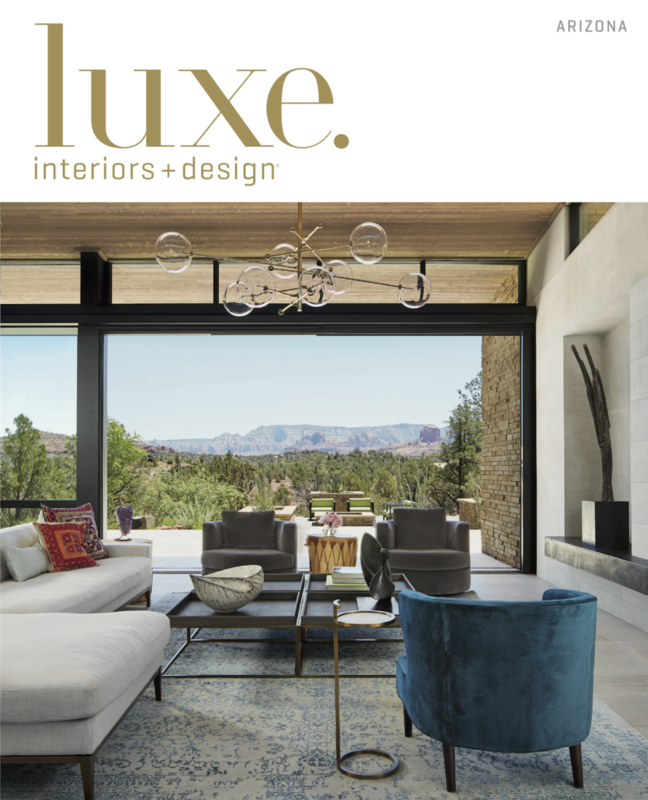 DW-designed project Desert Prairie was featured in the September/October 2018 issue of Luxe Interiors + Design. 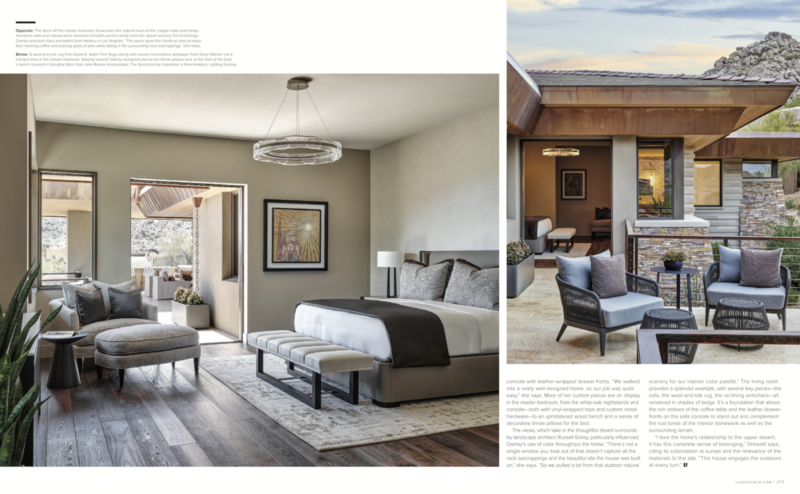 Thank you to Luxe magazine for featuring the project, writer James Munn for a beautiful article, and photographer Werner Segarra who brings the architecture to life on the page. Enjoy! Nestled near the base of Pinnacle Peak, a striking Scottsdale dwelling channels a Wrightian vibe. 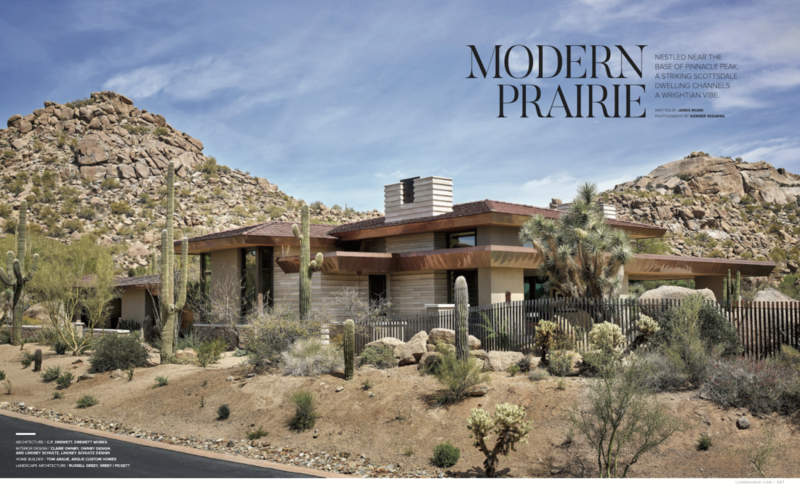 At rest amid boulder outcroppings on a Scottsdale hillside is an elegantly handsome, modern Prairie-style house—the latest creation of architect C.P. Drewett. With arresting views of the desert at large and Pinnacle Peak in particular, the residence succinctly reflects what the couple who owned the property had in mind: a home that displays a neat kinship to its surroundings and where any boundaries between indoors and outdoors appear as mere suggestion. Architect Frank Lloyd Wright developed the Prairie style around the hearth and fireplace; Drewett’s version sees the outdoors as the central element. 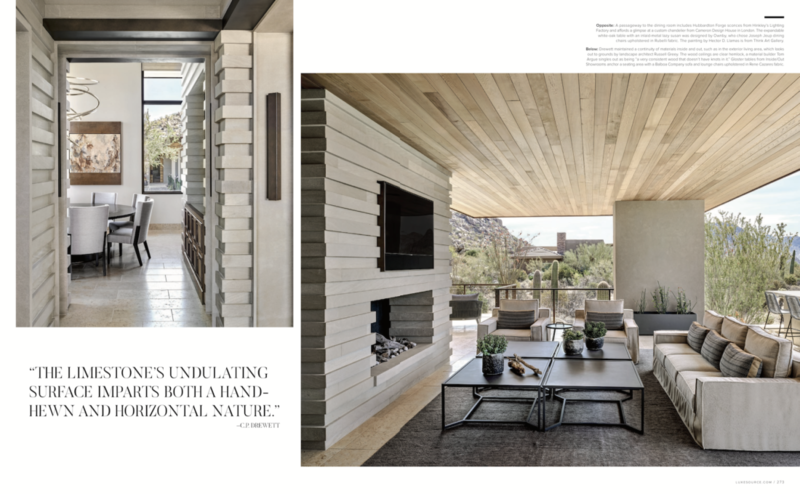 “The overhangs and sprawling nature of the Prairie style make it the perfect companion for the desert,” he says, citing the eaves’ ability to protect interiors from the searing summer heat. Although the roof is deep, it’s also thin, reinforcing the horizontal nature of the style. “This form dances in and out around the architecture, bringing the outside in,” the architect says. I love the home’s relationship to the upper desert; it has this complete sense of belonging. This house engages the outdoors at every turn. Drewett, who worked with builder Tom Argue, relied on several key materials to integrate the structure with the land. Battered living room walls are clad in natural stone that’s repeated on the exterior just below the master bedroom windows. Floors throughout are tiled in limestone, a material that provides perhaps the most eye-catching element of the architect’s design: the linear interior and exterior walls, which are reminiscent of Wright’s work and deliver an undeniable yet effortless through line. “Limestone is the hero material for the project,” Drewett says. “Its undulating surface imparts both a hand-hewn and horizontal nature.” The “elegant final touch,” he adds, is copper — seen most notably as cladding on the overhangs and as chains used for the gutter system. Interior designer Lindsey Schultz, who contributed interior architectural elements from paint color to millwork, helped integrate the materials inside. “I went through the whole home figuring out where it made sense for the limestone to come through,” she says. Schultz struck just the right balance in the living room, where the main limestone wall is inset with the space’s focal point: a forged-steel fireplace. The feature, which she collaborated on with Drewett, has a subtle elegance in keeping with the home’s horizontal dynamic. Outdoor living areas are just as well thought-out. “I consider the exterior spaces almost equivalent to the interior spaces,” Drewett contends, a logical attitude for such a warm and fairly dry climate and a stance that provides the architect with a lot of freedom. Still, he claims, it’s how the outdoor and indoor spaces relate to each other that requires delicate execution. “You don’t want to have pure redundancy,” Drewett says. 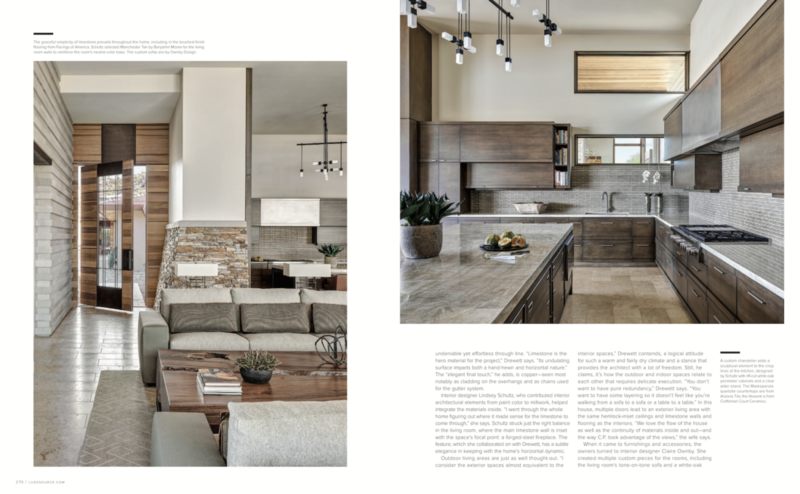 “You want to have some layering so it doesn’t feel like you’re walking from a sofa to a sofa or a table to a table.” In this house, multiple doors lead to an exterior living area with the same hemlock-inset ceilings and limestone walls and flooring as the interiors. “We love the flow of the house as well as the continuity of materials inside and out—and the way C.P. took advantage of the views,” the wife says. When it came to furnishings and accessories, the owners turned to interior designer Claire Ownby. She created multiple custom pieces for the rooms, including the living room’s tone-on-tone sofa and a white-oak console with leather-wrapped drawer fronts. “We walked into a really well-designed home, so our job was quite easy,” she says. More of her custom pieces are on display in the master bedroom, from the white-oak nightstands and console—both with vinyl-wrapped tops and custom metal hardware—to an upholstered wood bench and a series of decorative throw pillows for the bed. 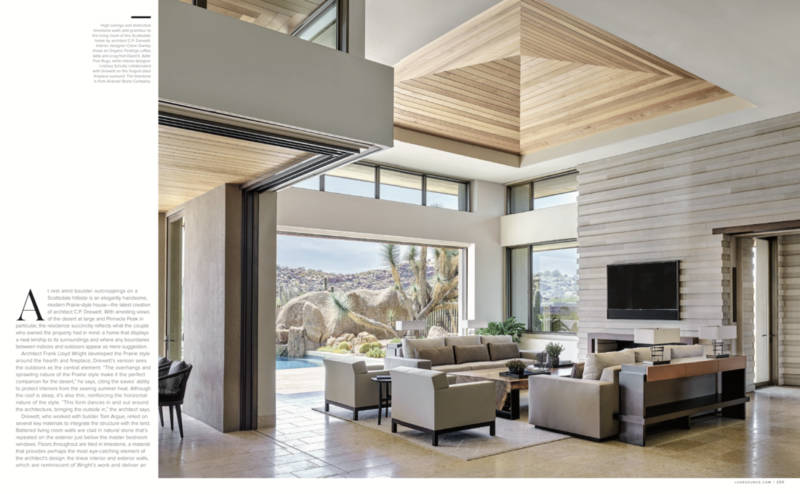 The views, which take in the thoughtful desert surrounds by landscape architect Russell Greey, particularly influenced Ownby’s use of color throughout the home. “There’s not a single window you look out of that doesn’t capture all the rock outcroppings and the beautiful site the house was built on,” she says. “So we pulled a lot from that outdoor natural scenery for our interior color palette.” The living room provides a splendid example, with several key pieces—the sofa, the wool-and-silk rug, the reclining armchairs—all rendered in shades of beige. It’s a foundation that allows the rich ambers of the coffee table and the leather drawer- fronts on the sofa console to stand out and complement the rust tones of the interior stonework as well as the surrounding terrain.